Source: Won from Sarah. Thanks! Otto, Jen and Charlotte are off to India for the trip of a lifetime. Arriving ahead of he others, Otto's soon enjoying the beach paradise they've all dreamed of. But when he discovers a girl dead in the shallows, he's suddenly thrust into the middle of a murder investigation. And then he disappears. As their dream holiday unravels, can Charlotte and Jen find their friend and prove his innocence-without putting themselves at risk? I haven't read any young adult science fiction and thrillers before, and having a chance to read one, is a great opportunity to learn about something new in reading. When I read the blurb of the book, I think I must give a try. Although I was looking forward to read the book, the starting point of reading from the the page one is like I'm pondering around what it is all about. Each chapter is narrated by each of them; Otto, Jen and Charlotte. They have their own distinct character by which Otto is acting like an easy-going person, love to explore some new place by himself first, but at the same time is a very loyal friend. His two best friends are Jen and Charlotte. I love Charlotte. She is sensible, attentive, reliable, and the most practical among three of them. Although sometime I think she acts like a boss, but she has to so that the three of them will make steps forward. On the other hand, Jen is a the most fragile and has a great sense of instinct. She knows that she is different and always knew that are great things upon her to find out the truth. When Jen suggested they travel to India, Charlotte is somewhat kind of against it but accepted the idea later. However, when Otto disappeared and involved in a murder investigation, both of them started to investigate based on anything they found and also with a little help of Jen's strong instincts. The story was not really that fast pace, quite a page turner to get the attention but need a little sometime to catch the interest. However, the author did a good job of describing Goa and it really kind of alluring and tempting, beautifully evoked. 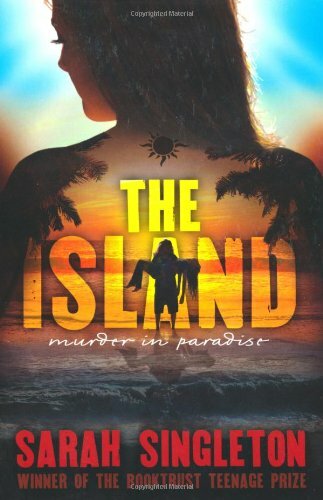 Added with great mystic and spiritual elements of mysteries about the Island which attracts Jen to be part of it. She always knew that Goa has something right for her all along, something pure that only few people in the world have the gift. It sounds unbelievable here, but believe me it quite make sense after they discover the truth. The book also has a great ordeal, action-packed wise, and a great mystery ahead and also a quest full of adventures. Other than that, the closeness between the three of them is very open and they act like real best friends although there's might be a spark between each of them. But being friends seem a better solution to keep them together and happy. The ending is quite okay but I feel like it could be a good stand alone if it is not a series. But I can't wait to read the sequel too! Overall, it's really a worth reading and I will try to read her other books. Fully recommended to any young adult science fiction and speculative fiction. I'm glad you enjoyed this, Darlyn! I'd probably like this just for the setting! I love the setting of this book and it sounds like a lovely story too. Great review! Great review. I really liked the cover too! I love SF, and the bulk of my reading is YA, so I really like the sound of this book! Great review. I think I'd like this one! Books where each chapter is narrated by a different character don't usually do it for me. This sounds like it was a bit of disappointment. Hi!! I'm your newest follower from FF, please follow back - I'll really appreciate it! Love the new background!! Sorry(just saw that you were recently tagged) but You have been tagged !!! Stop by and pick up rules of the game. Sometimes books that were narrated from a few POV can be rather confusing at first. I totally understand how that feels. But what pique my interest towards this book is that the author shift the setting of the book to India. That's somewhat cool to me!